Another week is coming to a close, and if you’re a toy collector, or just a nerd, what better way to kick it off than with another Funko Friday entry here at The No Seatbelt Blog? This week, we’re reaching for the classic that is Pulp Fiction once again, as Vincent Vega’s partner in bloody crime, Jules stands front and center to curse at you, pump you full of bullets and then abruptly change his ways after he witnesses what he believes to be a miracle. Much to my delight, Funko released this line of Pop! vinyl dolls to celebrate the 20th anniversary of Pulp Fiction, and the line features the movie’s best characters, and that bar is set extraordinarily high. 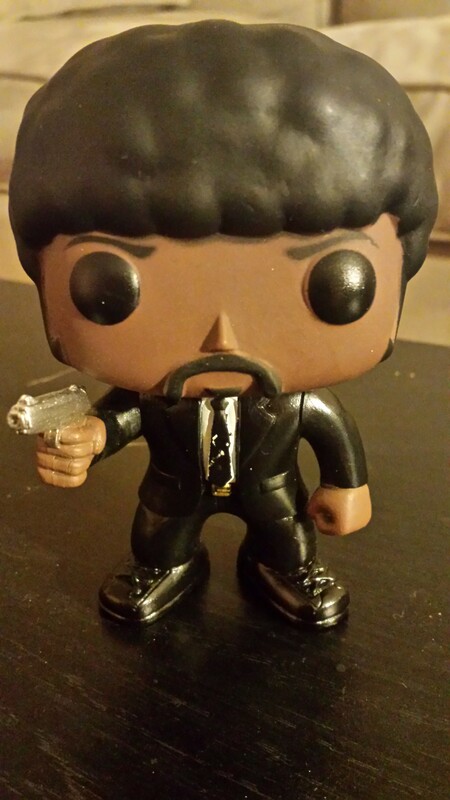 It seems that while doing the bidding of Marcellus Wallace, Jules here, played by the inimitable Samuel L. Jackson in Quentin Tarantino’s unforgettable film, was shrunken down to about 4 inches tall and shoved into a box so he could join my growing wall of Pop! dolls. I’ve always loved Samuel L. Jackson, and I would watch him swear at inanimate objects for two hours on screen as long as Tarantino is directing it, so it only makes sense that I would collect toys in any of his likenesses. Jules is showed here in all his jheri curl glory (complimented by his quite impressive sideburns), in his black suit and black tie, ready to recite his favorite Bible verse, Ezekiel 25:17, before he blows his target full of holes. Jackson’s character in this film has become immortal, providing audiences for the last two decades with comedy, a tinge of fear, and one-liners to quote for the rest of time. Rest assured, he will strike down upon you with great vengeance and furious anger, those who attempt to poison and destroy his brothers. But for now, he’s just hanging out here at The No Seatbelt Blog for a photo op. Funko Friday will roll on next week with another feature from one of my favorite toy companies! Until then, check out the other 140+ blogs that are stashed here at noseatbeltblog.com – movies, music, toys, beer, and much more have become the subject of the written word here!